This article is about the physical trackage used by services. For the service patterns, see List of New York City Subway services. The New York City Subway is a heavy-rail public transit system serving four of the five boroughs of New York City. The present New York City Subway system inherited the systems of the Interborough Rapid Transit Company (IRT), Brooklyn-Manhattan Transit Corporation (BMT), and the Independent Subway System (IND). New York City has owned the IND since its inception; the BMT and IRT were taken over by the city in 1940. The former IRT system is now known as the A Division, while the B Division is the combined former BMT and IND systems. In the New York City Subway nomenclature, a "line" refers to the physical trackage used by trains that are used by numbered or lettered "services". Today, the division or company names are not used publicly, while the line names may occasionally be used. The services that run on certain lines change periodically, but the lines refer to static trackage. In the nomenclature of the Subway, the terms "line" and "service" are not interchangeable with each other. While in popular usage the word "line" is often used synonymously with "service" (even sometimes on the website of the MTA), this list will use the formal usage of the term "line." A line is the physical structure and tracks that trains run over. Each section of the system is assigned a unique line name that begins with its original division (IRT, BMT or IND). For example, the line under Eighth Avenue is the IND Eighth Avenue Line. Some lines have changed names (and even divisions), but this happens relatively infrequently. By contrast, a service refers to the route that a train takes across the various lines. A service can operate along several lines and even along different divisions. For example, the R service operates along the IND Queens Boulevard Line as well as the BMT Broadway Line and the BMT Fourth Avenue Line. Each service is also assigned a color. Since 1979, each service's color corresponds to the line it primarily uses in Midtown Manhattan—defined as the trunk line—with these exceptions: the IND Crosstown Line, which doesn't carry services to Manhattan, is colored light green; and all shuttles are colored dark gray. The list of trunk lines and colors is shown in the table below. There are currently 36 rail lines. The Archer Avenue Lines and the 63rd Street Lines are each classified as two separate lines due to their structure: both lines are able to serve two divisions (the BMT and the IND) on distinct sections of track. In the list below, lines with colors next to them indicate trunk lines, which determine the colors that are used for services' route bullets and diamonds, as well as shuttle service lines. The opening date refers to the opening of the first section of track for the line. In the "division" column, the current division is followed by the original division in parentheses. The following list shows the connections between the different divisions of the New York City Subway. These connections are located within the subway's rail yards and are not intended for revenue service. In some places, there are track connections within the same division that are unused in regular service. At Broadway Junction, there is an unused flyover between the BMT Canarsie Line and the BMT Jamaica Line. However, sometimes the flyover is used due to service changes. At Prospect Park, the tracks of the BMT Franklin Avenue Line become the local tracks of the BMT Brighton Line. At DeKalb Avenue, there is an unused connection between the BMT Brighton Line and the BMT Broadway Line via the Montague Tunnel. At West Fourth Street–Washington Square, there is an unused connection between the local tracks of the IND Eighth Avenue Line and those of the IND Sixth Avenue Line. Between Bowling Green and the South Ferry loops, the IRT Lexington Avenue Line and the IRT Broadway–Seventh Avenue Line have crossovers on the balloon loop tracks. On the 42nd Street Shuttle, there are track connections to the IRT Broadway–Seventh Avenue Line at the west end and the IRT Lexington Avenue Line at the east end. It is not possible to operate through service on this line (i.e. one cannot go from the Broadway –Seventh Avenue Line to the Lexington Avenue Line using the shuttle tracks and vice versa), though the tracks are used to transport trains to and from Livonia Yard in Brooklyn. South of Broad Street on the BMT Nassau Street Line, the two-track line widens to four tracks. The two inner tracks are used to store and turn J and ​Z trains, while the two outer tracks continue to the Montague Street Tunnel and to the BMT Fourth Avenue Line in Brooklyn. On the IND Rockaway Line, a single track connects the branches of the wye at Hammels, south of Broad Channel, this was used previously for round-robin shuttle service and emergency H service. Many of the New York City Subway's lines have express tracks, unused in revenue service and generally only used for re-routes. IRT Jerome Avenue Line: Single center track between 149th Street–Grand Concourse and Woodlawn. Some northbound 4 trains in the morning and afternoon rush hours operate express from 167th Street until Burnside Avenue, where they short-turn. IRT White Plains Road Line: Single center track between East 180th Street and Wakefield–241st Street. IRT Dyre Avenue Line: Combinations of track and right of way between the flyover and Dyre Avenue. IRT Pelham Line: Single center track between Parkchester and Pelham Bay Park. IRT Broadway–Seventh Avenue Line: Single center track between Dyckman Street and 242nd Street. BMT Sea Beach Line: Two center tracks between 86th Street and Eighth Avenue. This was briefly used by the NX service in 1967–1968. In 1999, one of the tracks was rehabilitated and the other was disconnected from the line leaving it unusable. The track is used occasionally for reroutes in either direction and possibly equipment testing. In the past, these tracks have been used to store rolling stock that are about to be scrapped. BMT West End Line: Single center track between Ninth Avenue and Bay 50th Street. Occasionally used for reroutes in either direction. BMT Brighton Line: Two center tracks between Brighton Beach and Ocean Parkway. These are used for layups and for terminating/turning B trains but are listed here since they are a continuation of the express tracks from the Brighton line, and exist through Ocean Parkway station. IND Culver Line: Two center tracks on the portion between Jay Street–MetroTech and Church Avenue, then a single center track between Church Avenue and Avenue X.
BMT Jamaica Line: Single center track between Myrtle Avenue and Broadway Junction. IRT Broadway–Seventh Avenue Line: Single center track between 96th Street and 145th Street. IRT Lenox Avenue Line: Single center track at 135th Street. BMT Astoria Line: Single center track between 39th Avenue and Astoria –Ditmars Boulevard. This track was last used for W trains in the peak direction, and being unpopular with residents, was discontinued on January 15, 2002. IND Fulton Street Line and IND Rockaway Line: On the Fulton Street Line, a single center track between Rockaway Boulevard and west of 88th Street (the track continues through 80th Street but leads only to the Pitkin Yard), and two center tracks from north of Aqueduct to south of Howard Beach–JFK Airport on the IND Rockaway Line. Map of New York City Subway by line placement. Underground in orange; elevated, at-grade, embankment, open-cut in blue. Most of the New York City Subway is underground, except for the following segments. IRT Lenox Avenue Line is at street level at Harlem–148th Street. 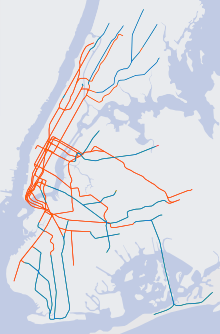 Map of New York City Subway by number of tracks on line segments. At minimum, in normal revenue service, all lines have two tracks, with one exception: the BMT Franklin Avenue Line has a single track between Franklin Avenue and Park Place. The New York City Subway has fewer triple track sections than it has quadruple track sections. These sections are listed below. The third track, when in use, is generally for peak-direction express service or reroutes, with exceptions noted below. BMT Jamaica Line (J, M, and Z​ trains) – from Marcy Avenue to Broadway Junction. Also, at 111th Street, the center track is not usable in revenue service. IRT 42nd Street Shuttle (S train) is operationally three tracks with one train on each; there is a fourth disused trackway that was disconnected in the 1960s. Additionally, there are several pocket tracks in the subway where the line temporarily widens from two to three tracks, such as east of Eighth Avenue on the BMT Canarsie Line, and south of Court Square on the IND Crosstown Line. Quadruple-tracked portions of track are fairly common in the subway system. This makes it unique among most metro systems in the world, as most others only have two tracks per line. Generally, these portions are a pair of express and a pair of local tracks unless otherwise noted. The Bronx has no four-tracked lines. Pocket tracks are not included. The following New York City Subway lines are either entirely defunct or have major portions no longer in service. 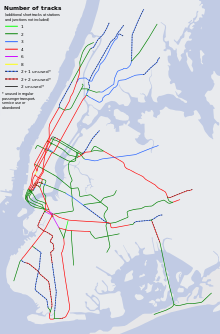 Defunct spur lines with one station, such as the South Ferry loops, are not included in this list, nor are surface transit lines. Bronx April 28, 1973 Entirely demolished; had been replaced for a time by the Bx55 and then Bx15 Limited buses. B (BMT) Canarsie Line Brooklyn 1865 November 21, 1942 at-grade Line from Canarsie–Rockaway Parkway to Canarsie Pier replaced with a streetcar line, which itself was replaced by the B42 bus. May 11, 1975 Remainder of line to Ninth Avenue abandoned, then demolished in 1985.
b) April 26, 1956 elevated a) Line demolished west of Rockaway Avenue. b) Remainder of line in Brooklyn demolished. Queens September 25, 1915 Line taken over by the IND in 1956, with the western two-block section rebuilt to connect with Grant Avenue. b) April 15, 1985 a) Line east of Queens Boulevard demolished. b) Line east of 121st Street demolished. Both segments were replaced with Q49 bus service, which itself was replaced in 1988 by the BMT Archer Avenue Line. B (BMT) Myrtle Avenue Line Brooklyn 1888–1889 1944–1969 elevated Line west of Central Avenue through Broadway to Lewis Avenue abandoned. Remainder of line west of Lewis Avenue demolished. IRT White Plains Road Line: Just north of the Third Avenue–149th Street station, exiting the tunnel portal, one can see the initial framework of the IRT Third Avenue Line. There used to be a connection from the White Plains Road line to the Third Avenue El, which ran south across the Harlem River to Manhattan. IRT White Plains Road Line: The other end of the Third Avenue El connected to the White Plains Road line at the lower level of the Gun Hill Road station (closed 1973). Also on the White Plains Road line is the remnant of the short section of track to the original Bronx Park terminal. IRT Jerome Avenue Line: North of the 161st Street–Yankee Stadium station is the framework for the connection from the IRT Ninth Avenue Line. IRT Dyre Avenue Line: The Dyre Avenue Line was part of the New York, Westchester, and Boston Railway; it continued north beyond Eastchester–Dyre Avenue to White Plains and Port Chester; and south of the present connection to the White Plains Road line at East 180th Street, to 133rd Street where it ran alongside the New Haven Railroad. The platforms of the NYW&B station are still visible at East 180th Street station and are sometimes used to store trains. The structure south of East 180th Street ends abruptly at the Lebanon Street. IRT Flushing Line: Part of the trackway from the Queensboro Bridge and the IRT Second Avenue Line is still visible at the east end of Queensboro Plaza. BMT Nassau Street Line/BMT Broadway Line: The BMT Nassau Street Line used to connect to the south side of the Manhattan Bridge north of Chambers Street. The trackways were disconnected from the Manhattan Bridge after the Chrystie Street Connection opened. Also, heading northbound over the Manhattan Bridge north side, an abandoned tunnel is visible before entering Grand Street. Heading northbound on the south side, the remains of the tunnel to the BMT Nassau Street Line loop is briefly visible. This area was reconfigured as part of the Chrystie Street Connection. BMT Fulton Street Line: Trackways are still visible at BMT Canarsie Line stations at Broadway Junction and Atlantic Avenue. Framework for the el was up until early 1998, visible at the Franklin Avenue Shuttle station at Franklin Avenue–Fulton Street. The structure served as a pedestrian walkway and was demolished in 1998 when the station and the Franklin Avenue Line was rebuilt as a single-tracked line. BMT Fulton Street Line: On the IND Fulton Street Line heading westbound from 80th Street, one can see the stub end of the old BMT Fulton Street Line continuing straight ahead while the IND Fulton Street Line curves into Grant Avenue, an underground station. BMT Culver Line (now IND Culver Line): At Ninth Avenue and at Ditmas Avenue, the original Culver line connected. The trackway is visible at Ditmas Avenue and the ramps are visible at Ninth Avenue. BMT Jamaica Line: West of Gates Avenue, one can see where the structure turned onto Lexington Avenue to head toward the Brooklyn Bridge. The structure is only visible from street level. BMT Jamaica Line: West of Marcy Avenue, the BMT Jamaica Line veers right onto the Williamsburg Bridge while the original structure continues straight ahead. BMT Jamaica Line: East of 121st Street, the 144th Street BMT powerhouse and 168th Street station house still exist along Jamaica Avenue. The LIRR's Rockaway Beach Branch runs from the White Pot Junction to just east of Rockaway Boulevard, where the IND Rockaway Line begins. a The route of the original IRT line, the first underground New York City rapid transit line, began at City Hall in the south, followed the IRT Lexington Avenue Line to 33rd Street, turned west on 42nd Street to Grand Central, followed the IRT 42nd Street Shuttle to Times Square, turned north on Broadway to 50th Street, followed the IRT Broadway–Seventh Avenue Line and terminated at 145th Street. b The IRT Dyre Avenue Line was formed from the purchase of abandoned New York, Westchester and Boston Railway trackage in 1941.
c The formation of the IND Culver Line occurred when the IND "recaptured" (e.g. New York City took over lines it had built for private companies) the trackage rights of the BMT Culver Line in 1954, connecting Ditmas Avenue to Church Avenue, the terminus of the IND Brooklyn Line. d For the extension of the IND Fulton Street Line in 1956, the IND "recaptured" the trackage rights of the BMT Fulton Street Line, connecting Hudson Street–80th Street to Grant Avenue. e The IND Rockaway Line was formed from the purchase of some trackage from the Long Island Rail Road's Rockaway Park Branch and Far Rockaway Branch in 1955.
f At Wilson Avenue, the southbound track is above ground while the northbound one is at-grade. However, the land directly adjacent to the subway station makes the lower level northbound track look as though it is underground, and the upper level southbound track look at-grade. ^ a b c d e f g h i "New York City Subway BMT Division Timeline". www.nycsubway.org. Retrieved May 7, 2009. ^ "New York City Subway IND 6th Ave Line". www.nycsubway.org. Retrieved May 7, 2009. ^ a b c d e f g h "New York City Subway IND Division Timeline". www.nycsubway.org. Retrieved May 7, 2009. ^ a b c d e f g h i j k "New York City Subway IRT Division Timeline". www.nycsubway.org. Retrieved May 7, 2009. ^ "First Train Runs On Elevated Line to Astoria Section". Brooklyn Daily Eagle. February 1, 1917. Retrieved June 29, 2015 – via Newspapers.com. ^ a b "New York City Subway Brighton Beach Line". www.nycsubway.org. Retrieved May 7, 2009. ^ Feinman, Mark S. (February 17, 2001). "Early Rapid Transit in Brooklyn, 1878-1913". www.nycsubway.org. Retrieved August 10, 2015. ^ "Subway FAQ: Interconnections Between IRT and IND-BMT Divisions". www.nycsubway.org. Retrieved November 12, 2013. ^ "Subway FAQ: Unused Track Connections". www.nycsubway.org. Retrieved November 12, 2013. ^ "Subway FAQ: Unused Express Tracks". www.nycsubway.org. Retrieved November 12, 2013. ^ "Subway FAQ: Elevated Sections of the Subway". www.nycsubway.org. Retrieved November 12, 2013. This page was last edited on 15 September 2018, at 08:52 (UTC).